Following a winter break, April is a good time to re-join Wildflower Wednesday, Gail's monthly celebration of (mostly native) wildflowers. It's such a joy having wildflowers blooming again here in the Chicago southland. The foliage is just as pretty as the flowers on celandine poppies (Stylophorum diphyllum, above,) also commonly known as wood poppies. While I've read they need consistently moist soil, they thrive here in our dry shade woodland garden. Celandine poppies self-seed readily, so I generally try to stay on top of deadheading them. Keeping them deadheaded also helps keep them blooming here spring through fall. I'm not sure if this a red or white trillium. We had both, though two of them haven't reappeared this spring. The reds were planted five years ago, and the white one two years ago. This will be the first one to ever bloom. Trilliums, also known as wake robin, can take years to become established and bloom. They are becoming more and more rare in their native habitats. Prized by many gardeners, care should be taken that they are purchased from reputable growers. Mom is very lucky to have a nice stand of them in her woods, but this is one of the plants I wouldn't disturb to bring home for our garden. It's the first year our Virginia bluebells (Mertensia virginica,) are blooming! Planted three years ago, some came from Possibility Place, our local native plants nursery. A few also came from K's (my firstborn's) garden last spring. They sulked after transplanting them here, wilting and dying back within a couple of weeks. I was so happy to see them come back this spring! Virginia bluebells, like trilliums, are spring ephemerals. Ephemerals are woodland plants with a short growing season during which they leaf out, bloom, set seed, and then the above-ground part of the plant dies back. Bluebells can be prolific self-seeders, forming large colonies in a few years. Now that our long-awaited blooms are here, some will be allowed to set seed, but most will be deadheaded to prevent them from taking over the garden. Extra seedlings can also easily be weeded from the garden or shared with fellow native-plant lovers. Last but certainly not least are these mystery Spring beauties (Claytonia virginica,) another ephemeral. I'm not sure how these tiny plants got here, but am happy they came! Most likely their seeds arrived with the other woodland natives transplanted from Mom's woods or K's gardens last spring, or maybe they were planted by squirrels or birds. Spring beauties are also known as fairy spuds, as the tubers (which are edible and said to taste like chestnuts,) look like tiny potatoes. Wildflower Wednesday is hosted on the fourth Wednesday each month by my friend Gail who blogs from Tennessee at Clay and Limestone. 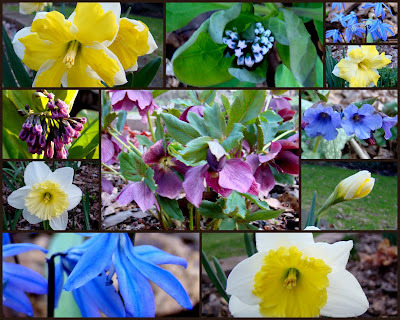 In honor of spring, this time she's celebrating wildflowers with a week-long extravaganza. Native plant lovers will revel in the plethora of inspiring posts by Gail and other participating bloggers. April Bloom Day - Yay Spring! Between our still mostly-chilly days this month, we've enjoyed a few gloriously mild, sunny ones. Every moment of those warmer days has been savored, with windows thrown open, patio furniture uncovered, and every possible minute spent outdoors. Blooms are a bit behind schedule compared to our last two springs, which were warmer than usual. I can't help hoping the cooler spring will lead to a milder, wetter summer than the last two hot, dry ones. We have daffodils, scillas, hellebores, bloodroot (bloodroot thanks to Mom and Monica!) pulmonarias, and celandine poppies blooming, with Virginia bluebells and a hellebore (Mrs. Betty Ranicar with white, double blooms, added three years ago,) about to the bloom for the first time. We have a few more bluebells transplanted last spring from my oldest daughter K's garden, and three of those will be blooming shortly too. 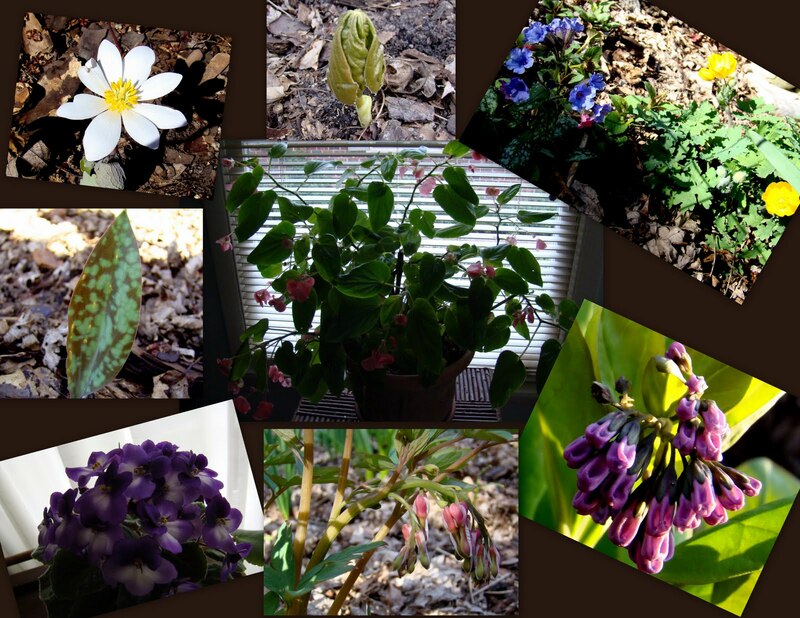 Bleeding hearts, wild geraniums, epimediums, anemones, and columbines, serviceberry, and Bradford pear are budding. Indoors, the African violet is once again in full, glorious bloom, and the one dragon wing begonia that's not in the basement is enjoying the streaming morning sunlight in the east window where it waits for warmer weather. The garden continues to mature and this season will bring more blooms than ever. At this moment though, what I'm most excited about is that bloodroot; and mayapples, Dutchman's breeches, shooting stars, and trout lilies - the natives brought back from Mom's woods last spring. All survived the winter and are up and growing. The trout lilies won't bloom yet this spring. They are young, and each has only one leaf. But what beautiful, unusual leaves they are with their brown and green speckles. Speaking of Mom's, by the time you read this I'll be on my way up to Southwest Wisconsin for a visit. I wonder what will jump out of the woods and into the car for the trip back home this time! For more Bloom Day posts, please visit Carol, the host of Garden Bloggers' Bloom Day where she blogs at May Dreams Gardens. A mom-turned-activist talks about what she learned after one of her children had a severe allergic reaction to a typical industrial-food breakfast.